Information about Matala on Crete, Pitsidia, Mires and Phaistos. Matala is a small village in the central south coast area of Crete. It’s famous for its caves, which form the backdrop to an excellent beach. 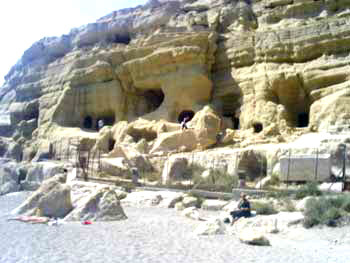 In Minoan times, Matala was most likely the port for the Palace of Phaistos, which is about 10km north of the village. Up to the 60s, there were only two or three houses in Matala. 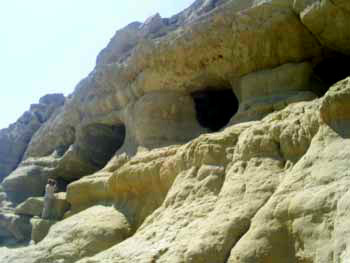 Thanks to the beach, German and English hippies quickly ‘discovered’ Matala, living in the caves barely 10m from the sea. Ten years ago the authorities forced them to leave, and now instead of hippies there’s a cluster of rent-rooms, hotels, restaurants and souvenir shops. In more recent years even bigger hotels have been built. Matala has exploded in size, but its only business is tourism. Somewhat ironically, if you want to view the caves that first bought the hippy trail to Matala, you’ll have to pay a €2 entrance fee to get past the fence which now encloses the caves they used to live in. The hippy era has definitely come to pass! Nevertheless, Matala is still an interesting place for a daytrip. The beach is no longer so attractive. 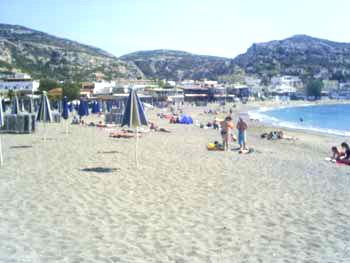 During the summer the place is packed full of buses and rental cars, whilst in the winter Matala becomes a ghost town. You’ll be able to appreciate the natural beauty of the beach – but don’t turn around to view the rather less attractive carpark and concrete hotels. 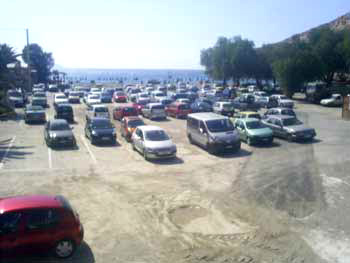 The enormous car park is just about the worst thing one can imagine next to such a good beach. Sadly, this is not the only big mistake that Cretans made with their public planning in the 1980s/90s. 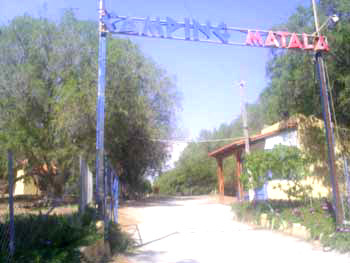 Accommodation in Matala: You can stay at the cheap campground, which is well-managed, well-shaded and close to the famous beach. If you’re looking for wild camping, you can find beaches close to Matala beach, but you won’t have any luck with Matala beach itself. At least every other building in Matala is a rent room or hotel. Prices vary with the season and demand. Pension Antonios has nice rooms at reasonable rates. Buses Matala: In 2019 there are 2-4 buses a day from Iraklio to Matala. Most of the beses go via Mires. In Mires you can change to Timbaki and Agia Galini. All buses to and from Matala go through the village Pitsidia.